Okay guys. There’s something going on with kimchi and . . . cheese. I don’t know where it’s coming from or if it’s even a thing. But, it’s something. Take for example: this. And this. It’s madness and, I KNOW, it doesn’t make any sense, but after tasting the combination, I think kimcheese should be shared with the world. 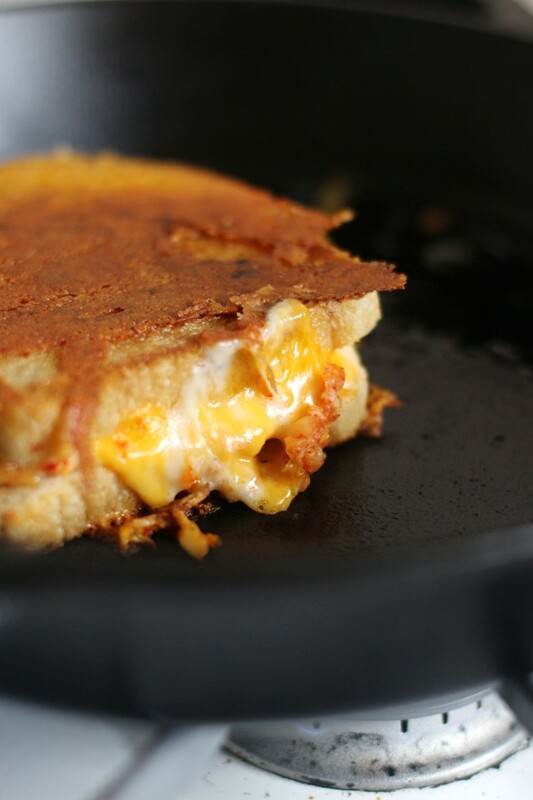 What better way to pair the two than in the quintessential American grilled cheese? This grilled cheese will blow your mind. First, start with some damn good kimchi. Next, make sure you cook your grilled cheese on a medium-low heat. 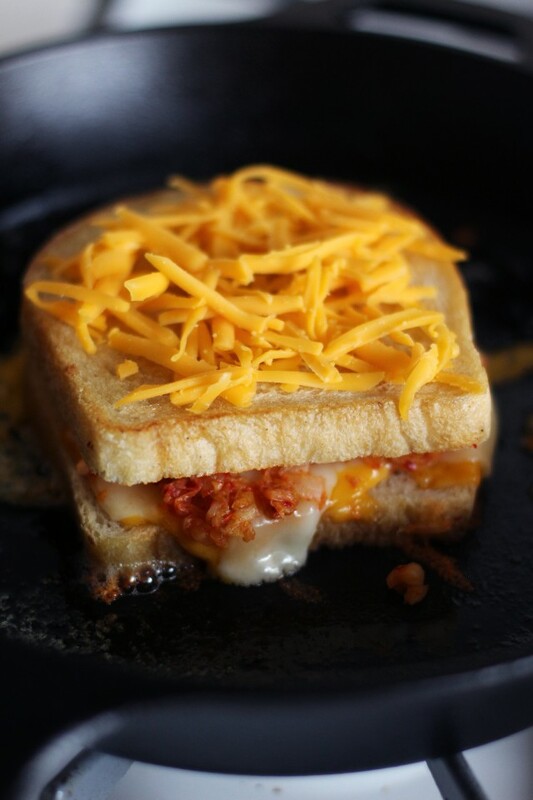 The key to a good grilled cheese is low and slow so that the cheese melts but the bread doesn’t burn. 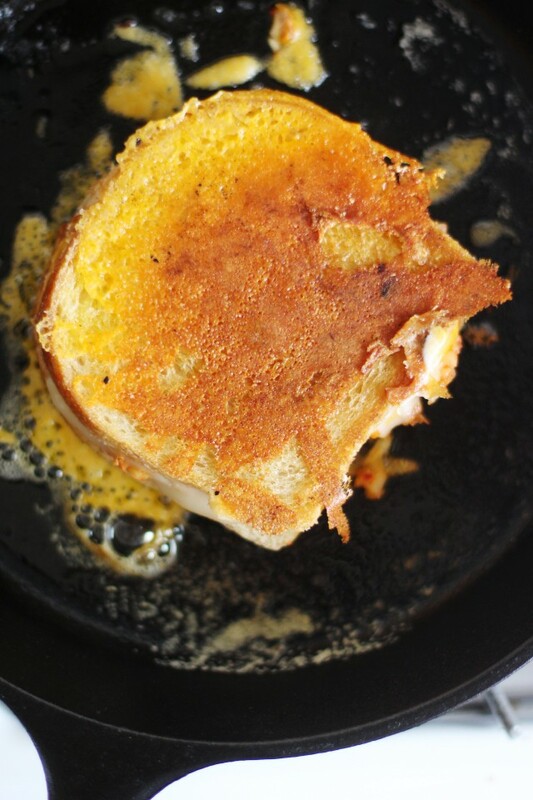 Third, let’s be honest, the best part of the grilled cheese are those burnt edges of cheese that fall out of the sandwich and get crispified in all that melted butter. So I cut to the chase and made an inside-out grilled cheese with an entire layer of that cheese crisp on both sides. 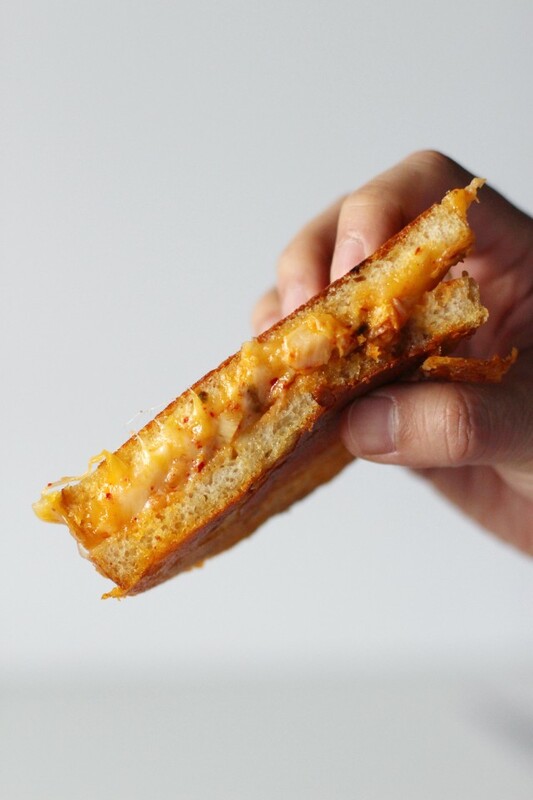 Grilled kimcheese sandwich: it’s the future. In a cast iron skillet or a thick nonstick pan, melt the butter over low-medium heat. Once the butter melts, place the slices of bread in the pan. Top one of the slices with a layer of the cheddar cheese and the jack cheese. Sprinkle the top of the cheese with the kimchi. 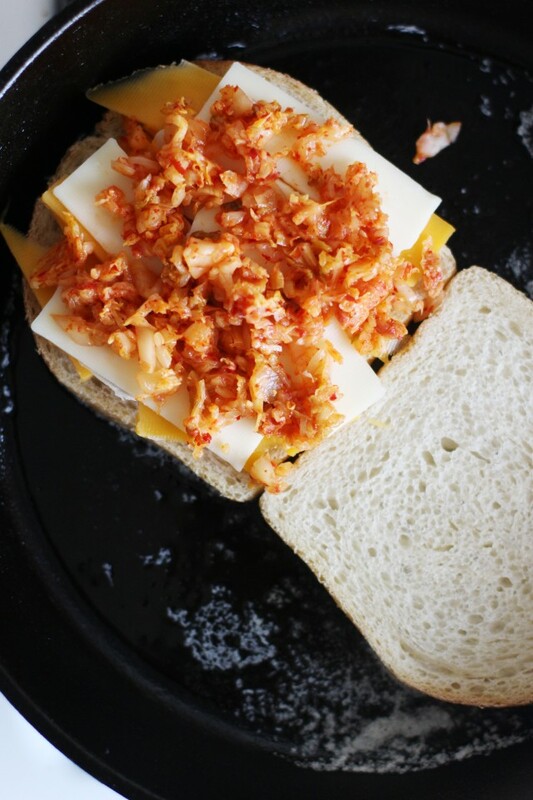 Flip the other slice of bread on top of the slice with the cheese and kimchi to form the sandwich. The bread should be buttered and just starting to crisp up along the edges but not browned. Sprinkle half of the shredded cheese on top of the top slice. Using a spatula, quickly flip the sandwich over. Let the bread and cheese brown while the cheese inside melts, about 1-2 minutes. Lift the bread and once the bottom is nicely browned, sprinkle the rest of the shredded cheese on the top side and flip the sandwich over. Cook for another 1-2 minutes until the cheese inside is fully melted. Oh kimcheese…where have you been all my life? This is that odd and perfect combination you hope to find in a relationship in life that is never expected but explodes and leaves you speechless in its perfection! Whoa, I’m all over this!! 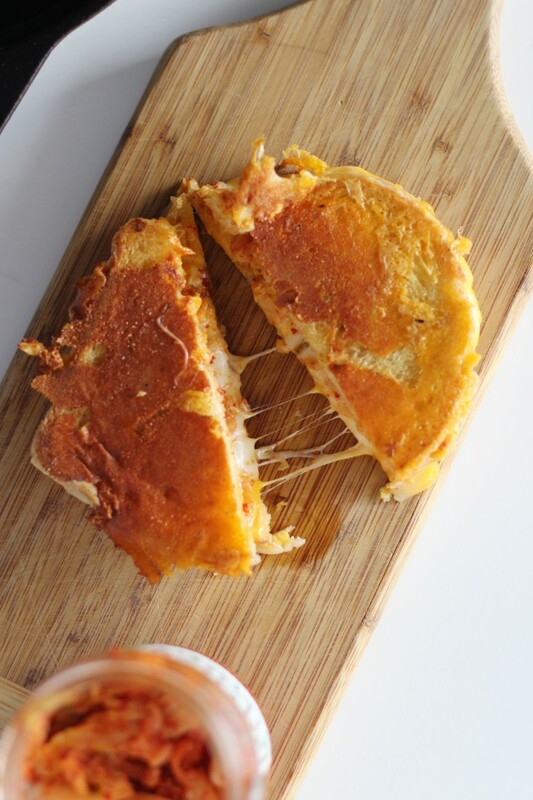 My sweetie and I have been putting sauerkraut or kimchi on cheesy toast for years, but I never thought to turn it into a classic grilled cheese. Genius! Oooh sauerkraut– now that’s an idea! This is something I am going to have to try! What? Kimchi pasta? I’m definitely trying that asap! I am SO into this. I’ve had kimchi in a cheesy beef burger, which was delicious! 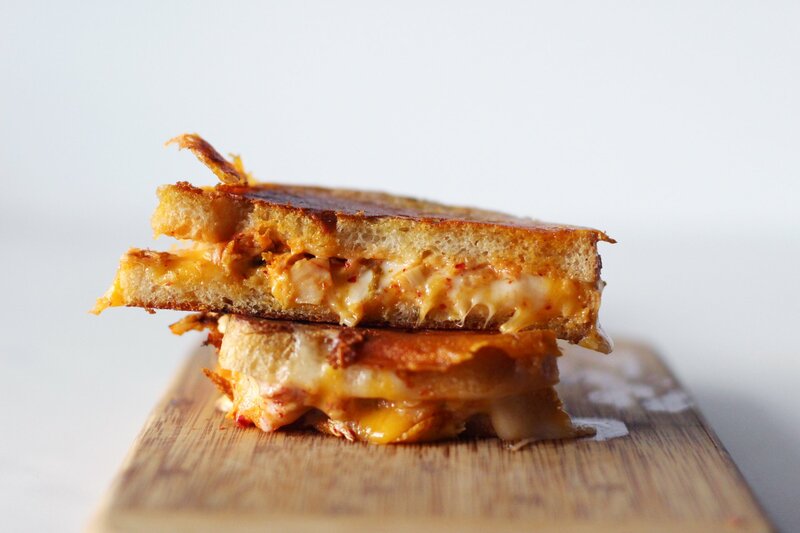 But in a grilled cheese sandwich sounds like heaven. 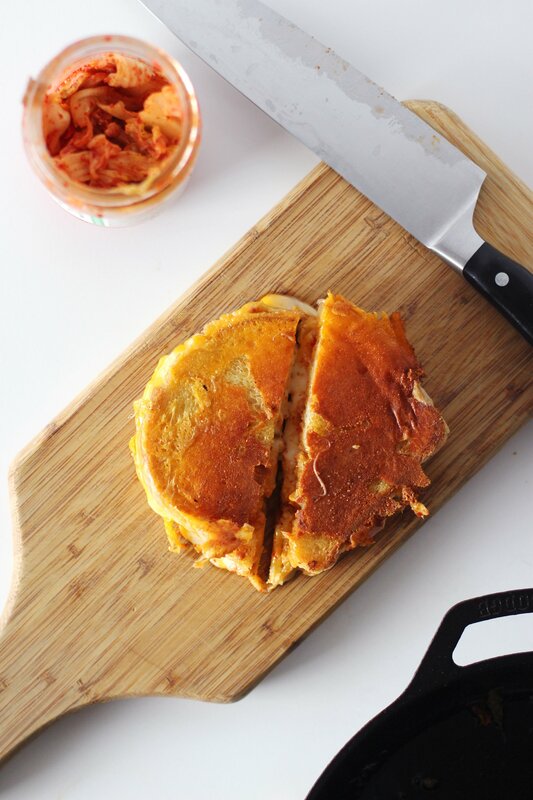 I’m surprised you didn’t throw an egg on top for a Kimchi Croque Madame! Oh man. Egg on top: mind blown.